By engaging in simple arithmetic, reading and writing exercises, SAIDO Learning helps senior citizens maintain and enhance the functions of the prefrontal cortex. Our programs have been implemented in various nursing homes for senior citizens and by local governments, leading to many successful results. SAIDO Learning is a non-pharmacological treatment which has been shown to ameliorate, or slow the progress of symptoms of dementia among senior citizens. SAIDO was developed by Kumon Institute of Education in conjunction with Professor Ryuta Kawashima of Tohoku University, and has been practiced in Japan since 2004. The method involves a caregiver (called a “Supporter”) who is trained to work with two elderlies (called “Learners”) by engaging them in a series of exercises and communicating with them. The exercises are performed five times per week and last 20 to 30 minutes. SAIDO Learning has been scientifically demonstrated to improve the function of the prefrontal cortex of the brain, as measured by two standard-use cognitive tests: the Mini-Mental State Examination (MMSE) and the Frontal Assessment Battery at bedside (FAB). 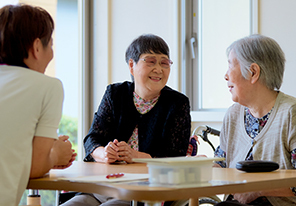 SAIDO Learning has been introduced into a variety of nursing homes for senior citizens, including residential care services, such as special nursing homes and long-term care health facilities, as well as into non-residential services, such as day service and day care. It is being practiced in around 1,400 nursing facilities across Japan, and is increasing its presence in the United States of America. Many qualitative changes have been observed in the seniors. For example, they smile more frequently, regain the ability to communicate with others, and become energized and motivated to learn. The benefits of SAIDO Learning, which is now receiving widespread attention, is the fruit of the quality of care offered at the facilities implementing SAIDO. By making full use of the learning materials seniors recollect past events or experience, which allows caregivers to enhance their communications with the elderlies and improve their quality of life, thus ultimately reducing the cost of their care. 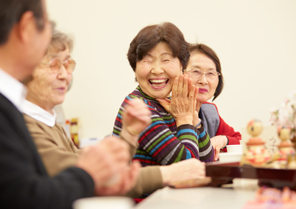 Lessons for senior citizens in good health aimed at preventing the onset of senile dementia are being held in around 230 municipalities in Japan. Local governments, nonprofit organizations, and other organizations host the Centers, and volunteers from the local community aid the participants in their study. These venues then become places for people of different generations to communicate and make friends with one another through learning which, in turn, contributes to the revitalization of the community.